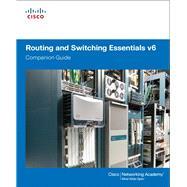 Routing and Switching Essentials v6 Companion Guide is the official supplemental textbook for the Routing and Switching Essentials course in the Cisco Networking Academy CCNA Routing and Switching curriculum. · Check Your Understanding–Evaluate your readiness with the end-ofchapter questions that match the style of questions you see in the online course quizzes. The answer key explains each answer. · How To–Look for this icon to study the steps you need to learn to perform certain tasks. · Interactive Activities–Reinforce your understanding of topics with dozens of exercises from the online course identified throughout the book with this icon. · Packet Tracer Activities–Explore and visualize networking concepts using Packet Tracer exercises interspersed throughout the chapters and provided in the accompanying Labs & Study Guide book. · Videos–Watch the videos embedded within the online course. · Hands-on Labs–Work through all the course labs and additional Class Activities that are included in the course and published in the separate Labs & Study Guide. This book is part of the Cisco Networking Academy Series from Cisco Press. Books in this series support and complement the Cisco Networking Academy curriculum. Cisco Networking Academy teaches hundreds of thousands of students annually the skills needed to build, design, and maintain networks, improving their career prospects while filling the global demand for networking professionals. With 10,000 academies in 165 countries, it helps individuals prepare for industry-recognized certifications and entry-level information and communication technology careers in virtually every industry–developing foundational technical skills while acquiring vital 21st-century career skills in problem solving, collaboration, and critical thinking. Cisco Networking Academy uses a public-private partnership model to create the "world's largest classroom."